There's no need to develop or download a mobile app with Mobile Journeys. Send out instant surveys, income & expenditure assessments & applications, all from one interface. Obtain data & the valuable insight your business needs when interacting with customers while improving response rates using quick, cost-effective and manageable Mobile Journeys. Mobile Journeys are perfect fo their multi-channel opportunities. Integrate with other Esendex products, email, Voice and SMS or use them independently to capture data. Collecting data works better when you do it on your customers terms. Interact with them at a time and place, and in a way that suits them. Mobile Journeys work 24/7 meaning that you can be building up responses from anywhere in the world at any time of day. We are a PCI DSS and ISO 27001 accredited company which shows that we recognise just how important security and responsible operations are to businesses within highly regulated environments. Monitor the performance of your journey, identify drop out points and improvements responsively as data is captured. Process the data as it is collected with our fully managed service allowing you to respond just as quickly as your customers can to you. As a fully managed service, we can pass on the benefit of experience and the hundreds of hours we have spent developing. With a low initial set up cost followed by manageable monthly payments, Mobile Journeys make feedback and data collection simple. "We’re driven by our customers’ needs so we’re always looking for ways to enhance our services and pride ourselves on innovation." A journey of information & data capture. Create a complete journey that removes distractions from beginning to end and makes it simple to conduct instant surveys and perform income and expenditure assessments or applications. From the point of capture through to processing, tracking and reporting, Mobile Journeys are cost-effective and using the familiarity of mobile means a far higher success rate - increased conversions for your business. A secure and interactive enriched media solution, our Journeys remove the requirement to download or develop a mobile app and are triggered simply, with a web link within an SMS or email. This means your survey, assessment or form can be received and engaged with pretty much instantly. "62% of people think that apps have reached market saturation and that something new is needed." 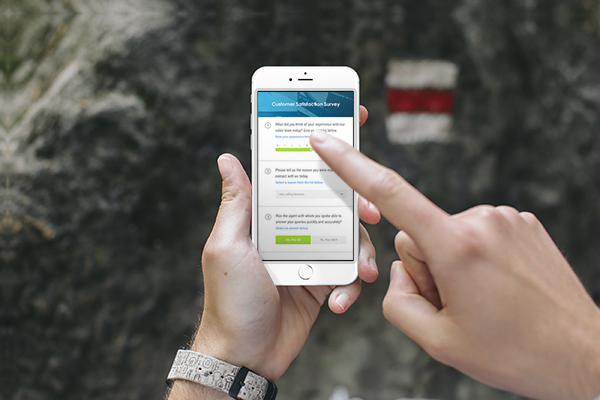 Inviting users to respond to a survey by SMS rather than email achieved a 53% response rate. 80% of people would be likely to respond to an online survey. 23% of Irish marketers lacking a mobile marketing strategy.